Just thought I'd share a few more pics of items to fill the nursery. We are in the process of putting it all together now but the room is definitely still under construction. Kyle has even gone to great lengths to add crown molding to the nursery (in addition to the rest of the entire house that didn't have it). Kyle's also been busy scraping the popcorn off the remaining ceilings in the house that had it. Amazing how one room (or a baby) will spur on so many home improvement projects. He's got a lot on his plate, for sure! I guess there's hardly a chance of us getting to these things once baby Kate arrives, so we're trying to be productive now! I just wish I could help out more with the projects! it's all kinda exciting! 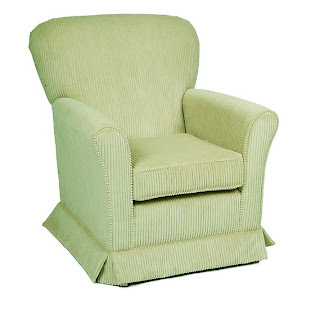 In any event, here's the glider we chose in a mint green, soft plush material -- it also has a matching ottoman. 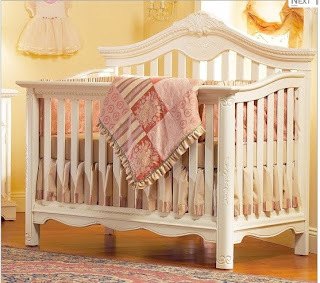 The crib is one of of my favorites! It's really going to be beautiful and a focal in the room with the fabulous bedding that's on it's way! Hooray! 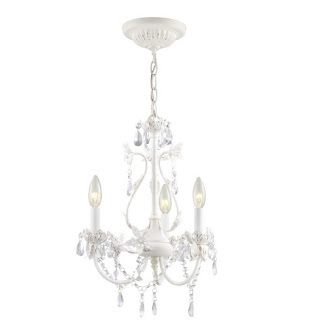 Since we're expecting a little girl, the chandelier was a must, right??? We're also using an old antique dresser that we own for the changing table and it's also in the antique white color. I know we've really only shown bits and pieces of everything, so we'll definitely post pics of the nursery coming together very, very, very soon. LOVE the crib!!! I was practical and chose something that I could use (and did!) if I had a boy later on, but I REALLY wanted the girly stuff!!! !